The Device Shop is dedicated to 100% customer satisfaction, and has now fixed over 55,000 broken devices. Our experts have assisted thousands of customers and we want to help you. Do not go another day without getting your device fixed. Make an appointment today! If you’ve tried to fix your iPad Air yourself but aren’t able to finish the job, we can help with that too. Give us a call or come in at your earliest convenience. The iPad Air 2 launched on October 22, 2014. The Device Shop started fixing screens shortly thereafter. The parts across for these models are the same and most repairs can be fixed within two hours. 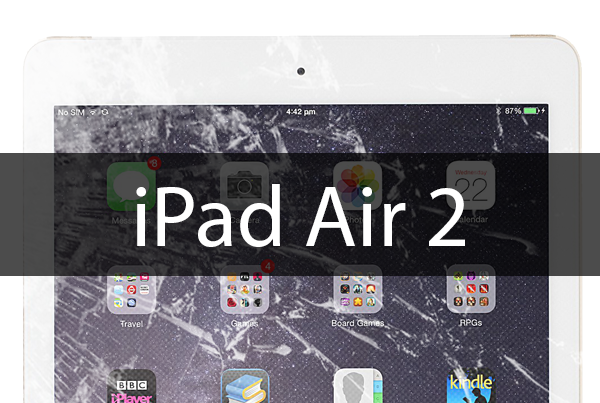 The Device Shop offers iPad Air 2 screen replacements in just 90-120 minutes. *If you have any issues with your iPad Air 2 other than the glass that need to be replaced, there is a good chance that the glass will be broken while removing it to access the other damaged part. If this happens, The Device Shop charges an additional fee, based on the current market rate of the cost of the screen.